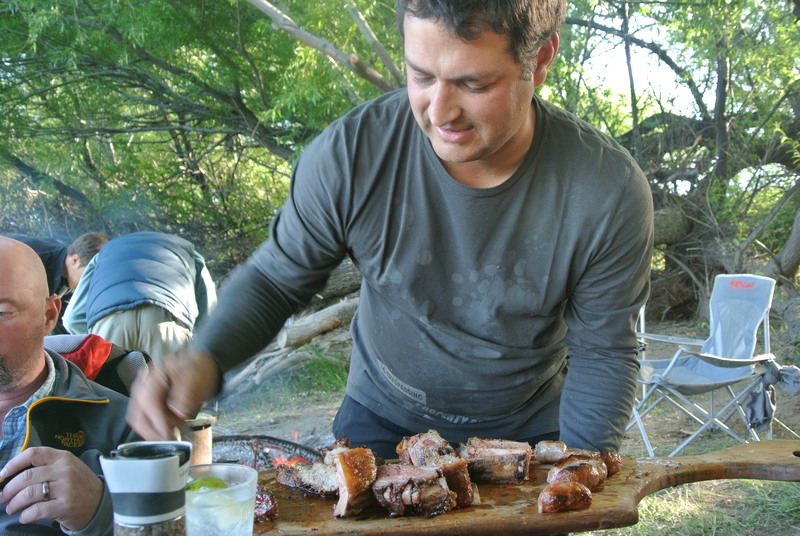 I have just returned from fly fishing in Argentina, and decided to share a few photos and some Asadore BBQ cooking with my ole buddy Claudio, who is a master at the art of camp cooking. 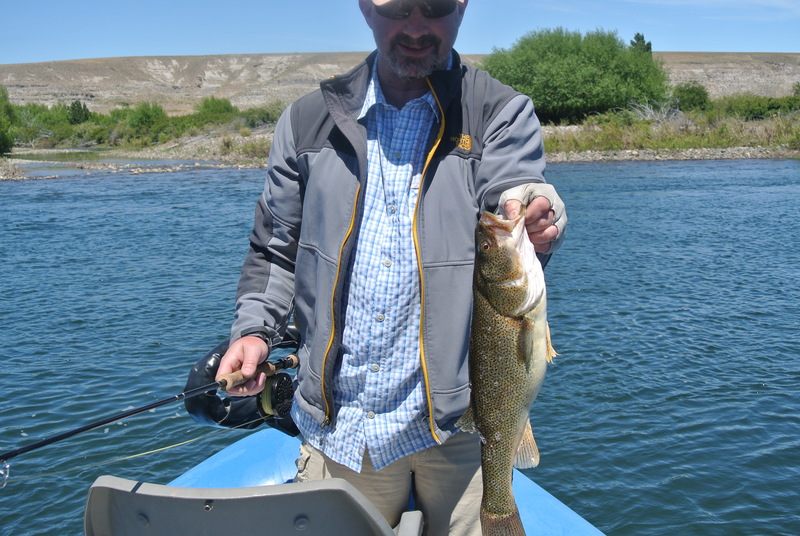 The fly fishing was a little early in the season, for a guy that loves Dry Fly action it was slower this time of year, though I did get quite a few fish on dries, streamers seemed to be producing more fish. 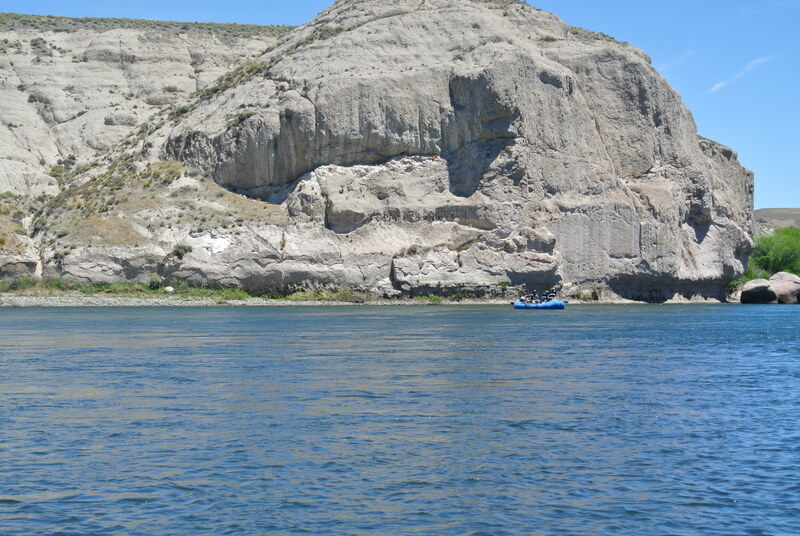 Ryan and Kevin have never been to Patagonia, so this was a new adventure. Ryan and Santiago enjoying a little rest and some sun. We like to target the big browns, but the Rainbows were a lot of fun as well. Kevin caught a few Bass, which was unusual to me because I have never caught one here before. They fight pretty good, and look to me like a big large mouth bass. Large Mouth Bass? I am not sure, but they were fun to catch. 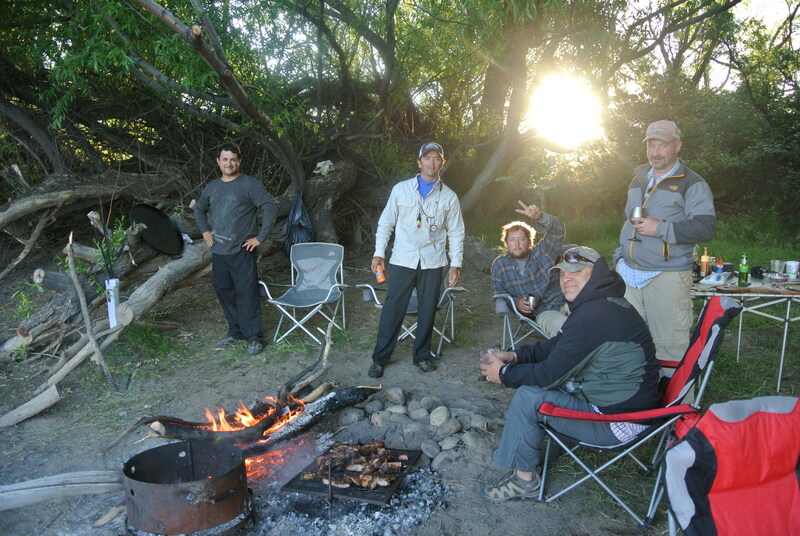 In the middle of the week, we decided that we would do a camp over on the river. 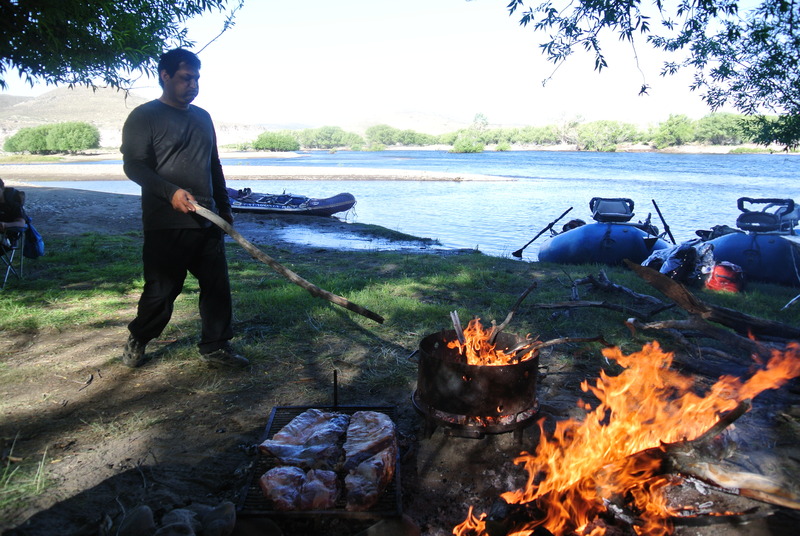 Patagonia River Ranch made this possible for us, and let me tell you it was 5 star camping. We were not so sure that we were going to go, but when I found out that Claudio was going with us to cook. That decision was made in one second. Where ever that Chef Claudio was going….I was going. 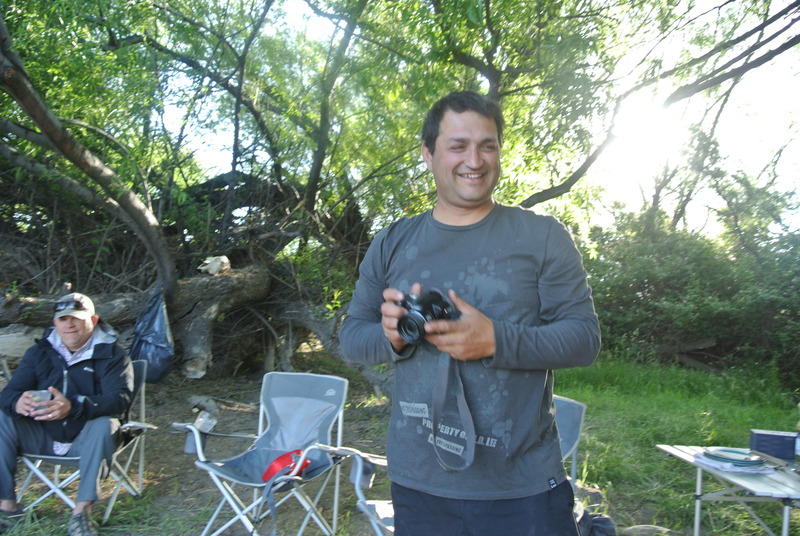 The camp staff went down before us, to put up the tents and prepare dinner. 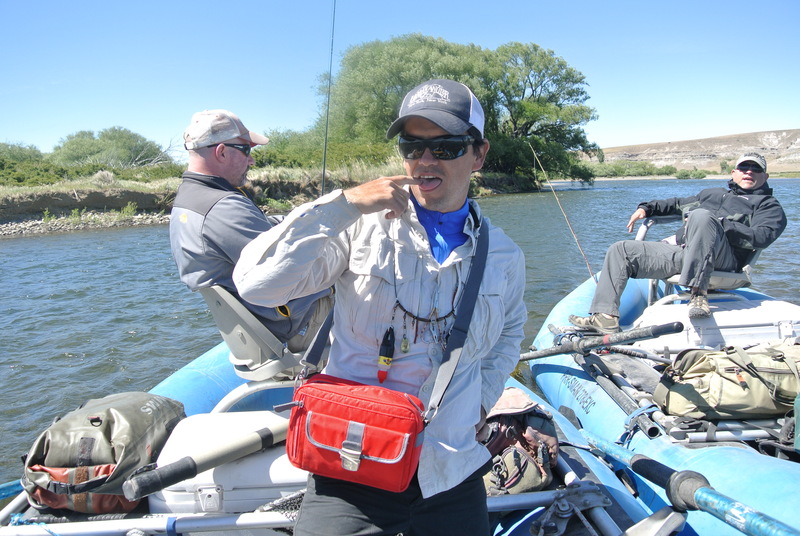 Nicko Uribe was my fishing guide, as he has been for years, and Santiago was fishing the other buddies as we just fished until we had blisters on our hands. The wind made it a little difficult, but just meant you would have a sore shoulder from working so hard. Nicko and his man purse. 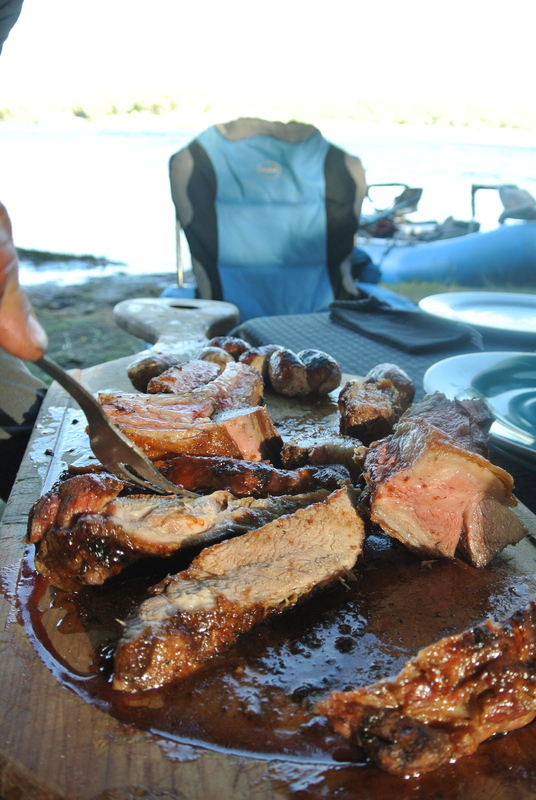 We really looked forward to the lunches they made for us on the side of the rivers every day. However, I was looking forward to dinner…. We had great lunches and great wine every day we were there. This is not a place you would want to go to if you were on a diet. 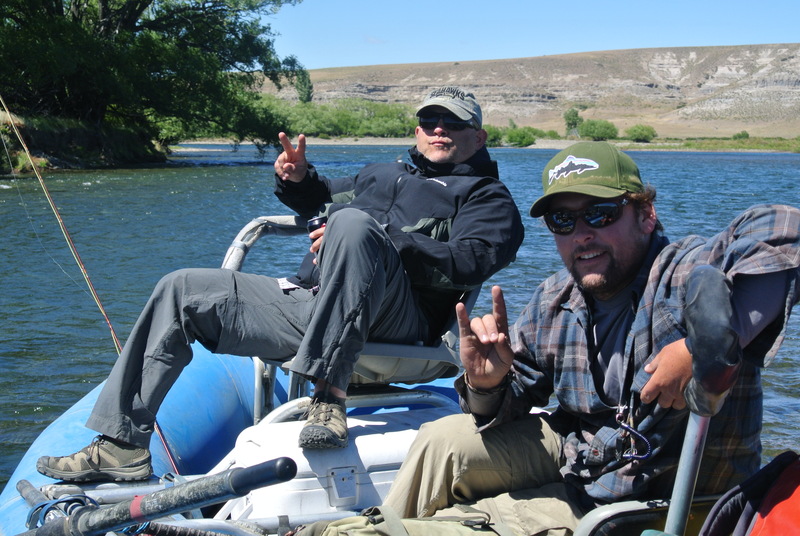 I think we were about 2 miles up river and I could smell something divine, and I knew my buddy Claudio was just around the bend. I almost started whipping Nicko to row the boat faster. If you are hungry right now, do not continue with this blog. There is a nice fire going, and they set up chairs around it so we could watch Claudio work. 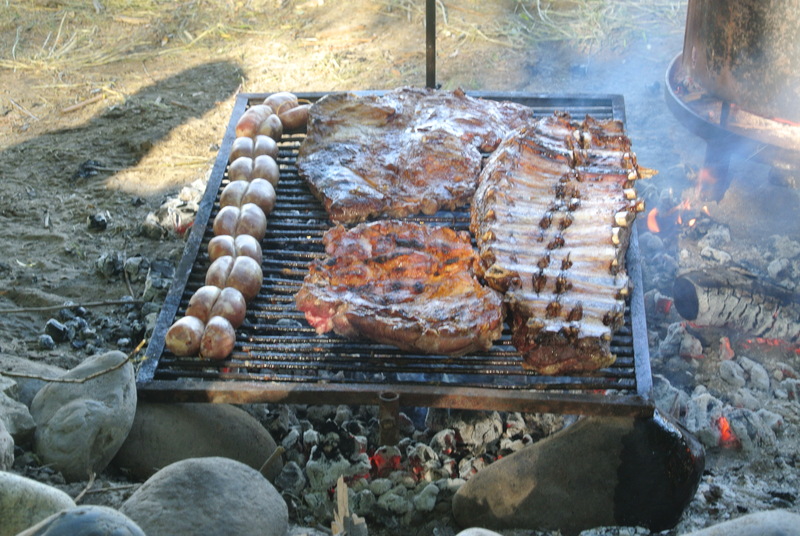 Claudio had brought sausage, beef ribs, and a nice flank steak to the party. Claudio does not have just one type of meat, he has 3 types. I just stayed back, drank my wine and watched the master work. 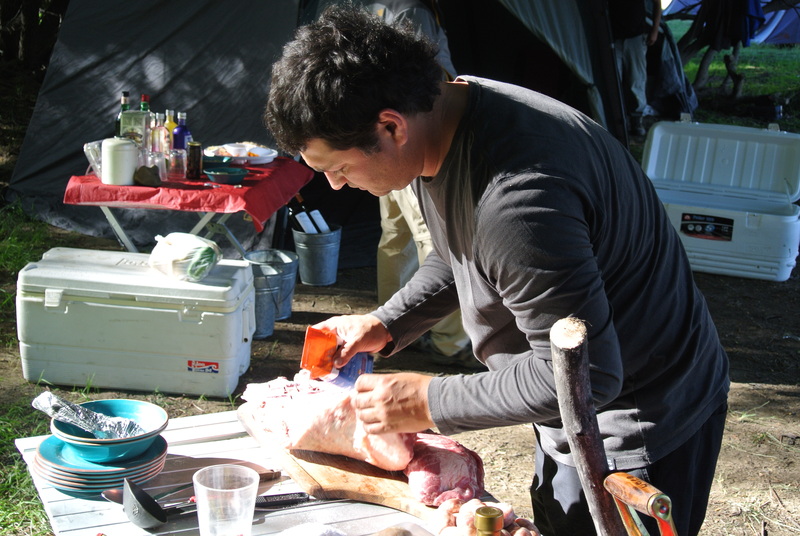 Preparing his meats for the fire. There is an art to this type of cooking. 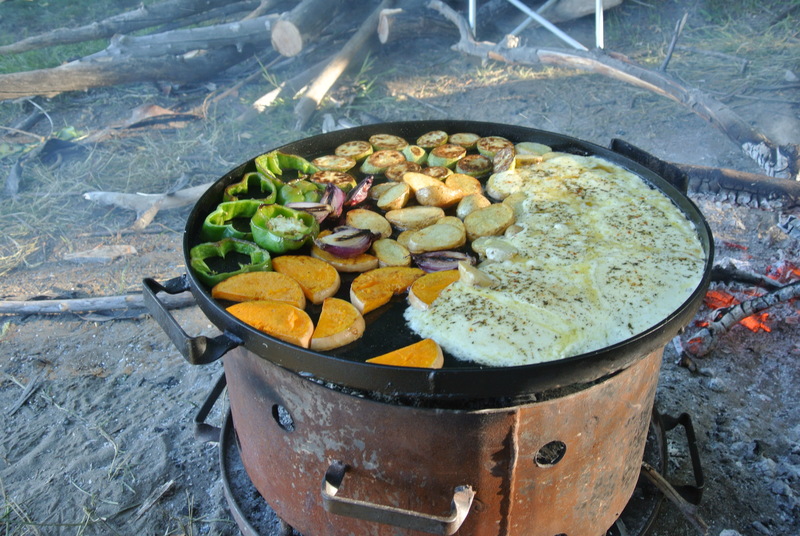 The heat has to be perfect on the Chapa (Steel or cast iron large skillet). The coals have to be rendered and it is an art of slow cooking is good. Getting the coals ready to work with, and he did not even get the trees on fire. I am telling you, there was something that was so relaxing watching this process. Perhaps, because it was not me cooking and I know the stress and pressure of putting on a dinner like this, or because he made it look so easy. Oh no he didn’t??? Look at that slow roast going on here. 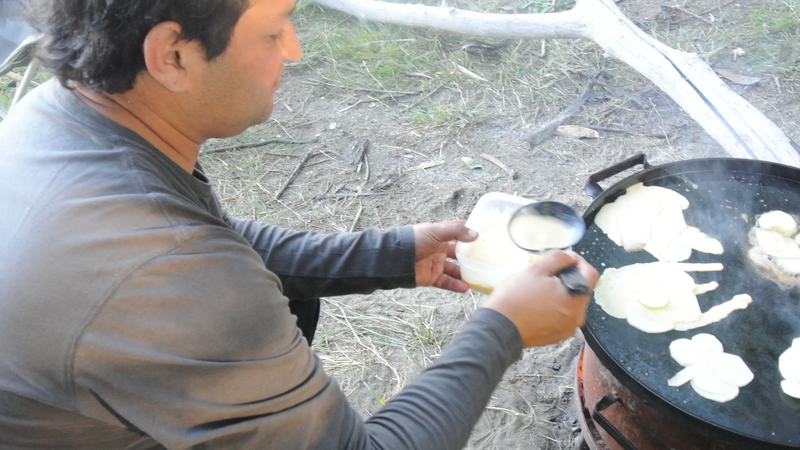 Then he brings out what I think is called a Chapa, this he will use for his side vegetable dishes and later….DESERT! 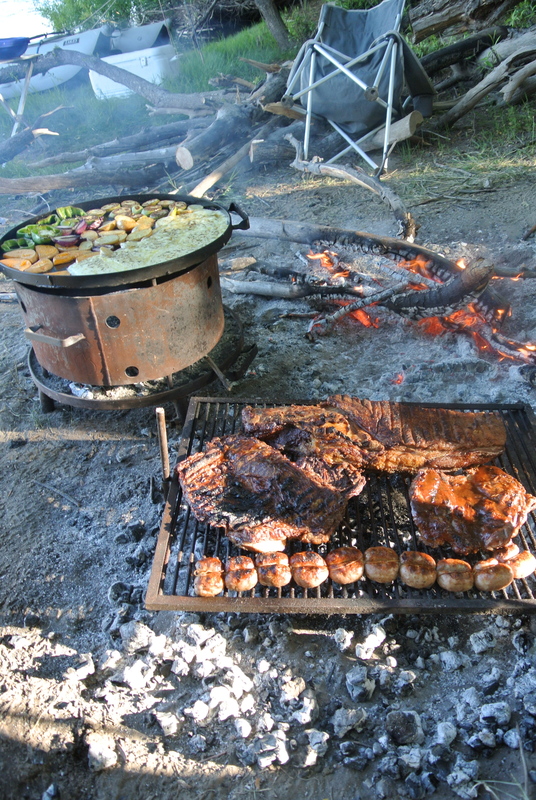 I cannot tell you how the smells of an open fire with the right wood smoking the meats and the sizzle of the veggies. A little light oil, and he gets his vegies on the Chapa. 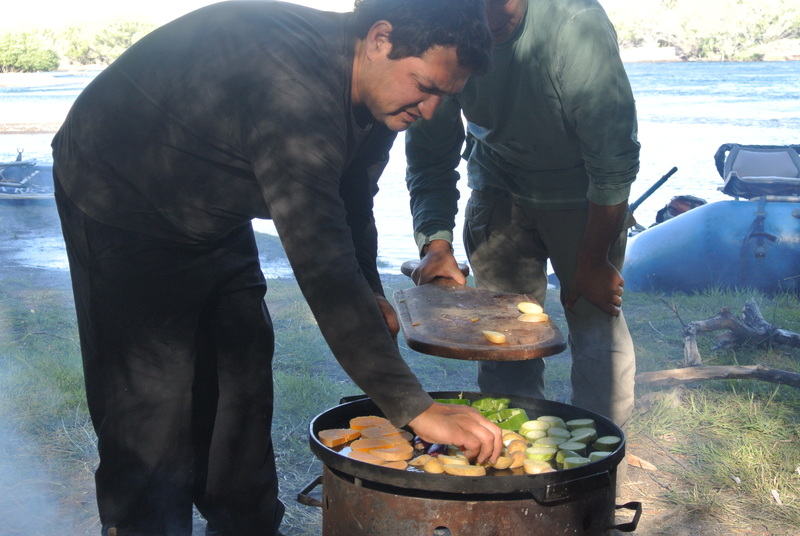 Then Claudio does the impossible, he adds fried cheese besides the roasted veggies. I am going to take two cholesterol pills tonight. Fried Cheese? Oh my the Gods are looking down on us tonight. The three of us and all the guides are salivating at this point pretty good. I had to stare at this for an hour, maybe longer. The wines they brought are all Malbec’s of the region and very good. 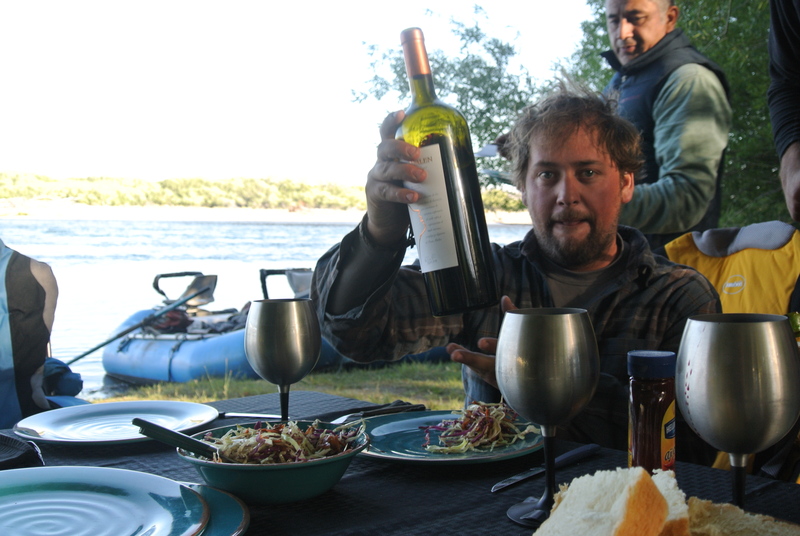 I love drinking Malbec’s they have lots of flavor and go so well with the meals we had. 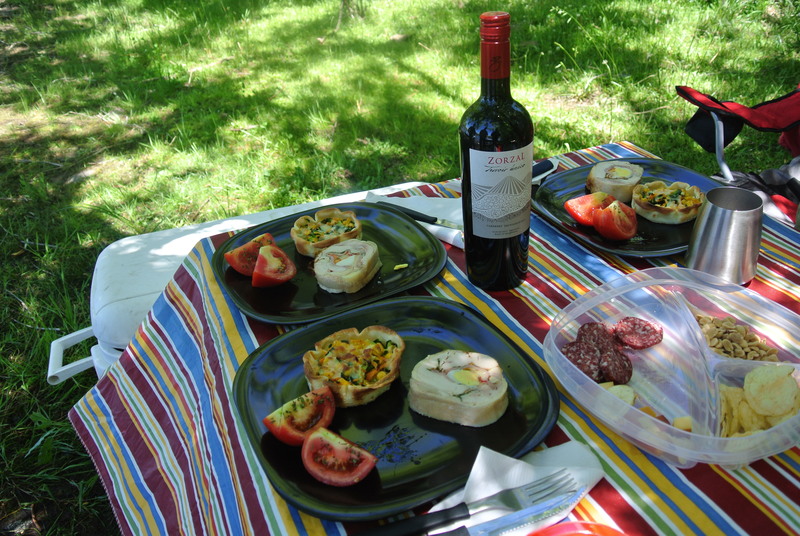 It is almost time for dinner, and we are really enjoying our wine.  Now for the moment of truth…. 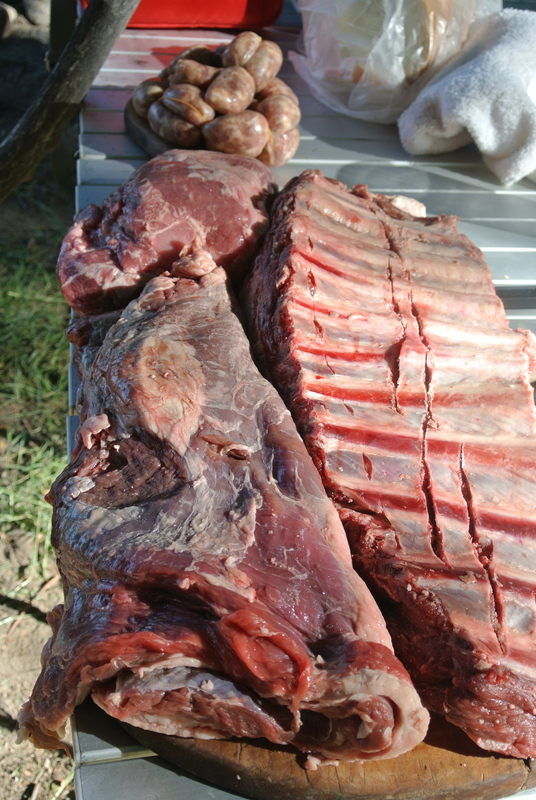 The juices are just flowing out of the meat, it was moist, had some smoke to it. Cooked to perfection. We are pretty much gorging ourselves like we are Romans, except we do not really exercise that much so its not really like Romans except for the eating part. At this point, I am so full but I keep a close eye on Claudio as he prepares the desert. OH SNAP!!!! Check this out. 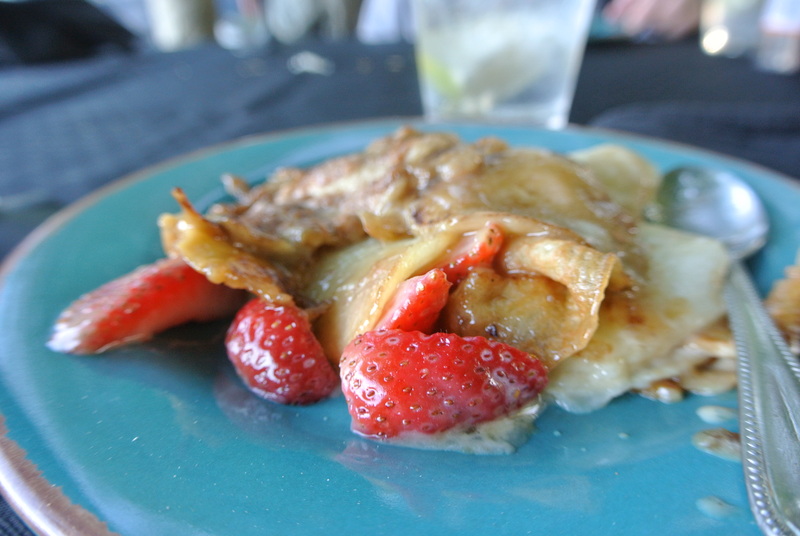 These are crepes, with strawberries and a cream sauce. We all did about 5 jumping jacks in order to make a little room in the belly. I am going to tell you, this was really, really good. 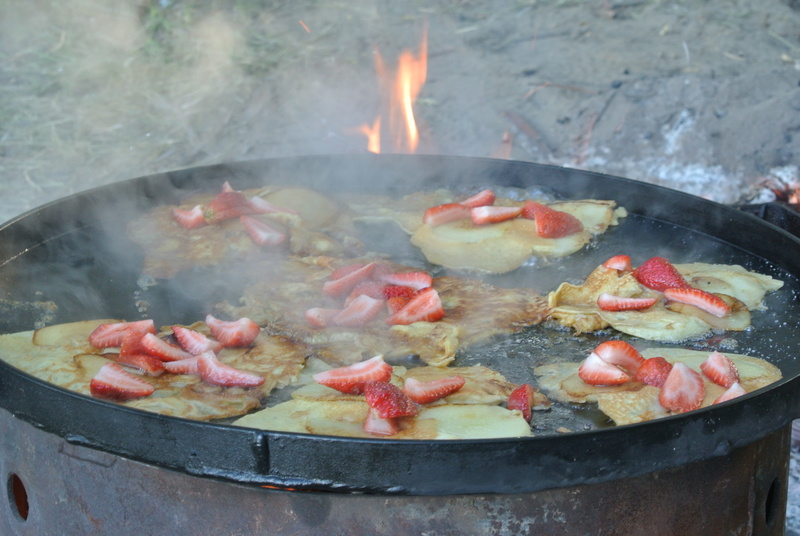 You could not have asked for a better dinner, especially while camping. We were trying to figure out how to sneak Claudio out of the country in our bags. More wine Shay? Well of course Santiago. We were full, we were happy, and it was getting cold so we had to move ourselves to the fire for some laughs and some great times. 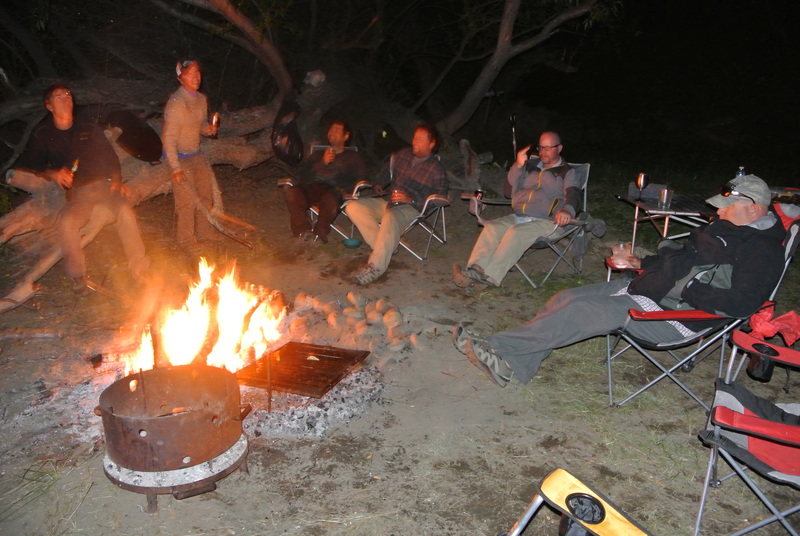 We basically sat by the fire until we got hungry again then reheated meat on the fire. We all really enjoyed each others company and enjoyed the evening. Nicko and Santiago who is trying to get the music on the I phone working. We talked about the day fishing and who caught the biggest fish. Strange how they got bigger and bigger with food and wine in the belly. We had a great time with these guys. Claudio always puts on a great show and I respect the heck out of his cooking. 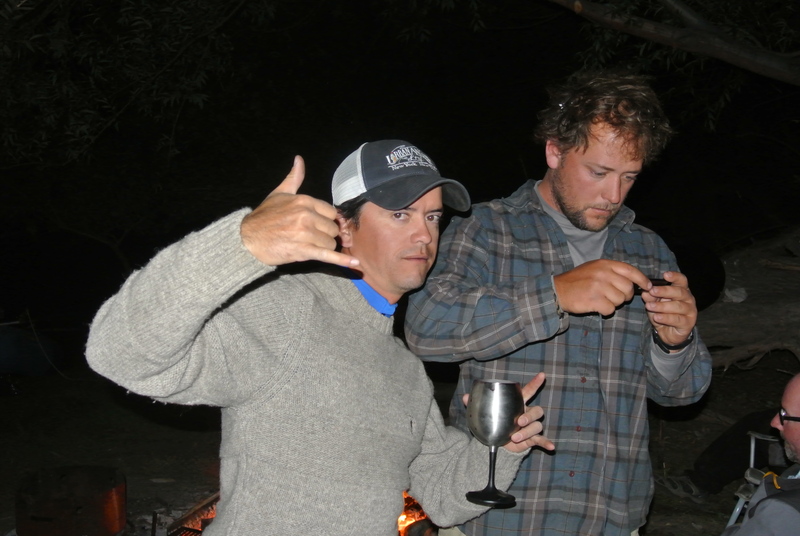 We had a great time in Patagonia, we caught a lot of fish, ate a lot of food, and had a lot of laughs. 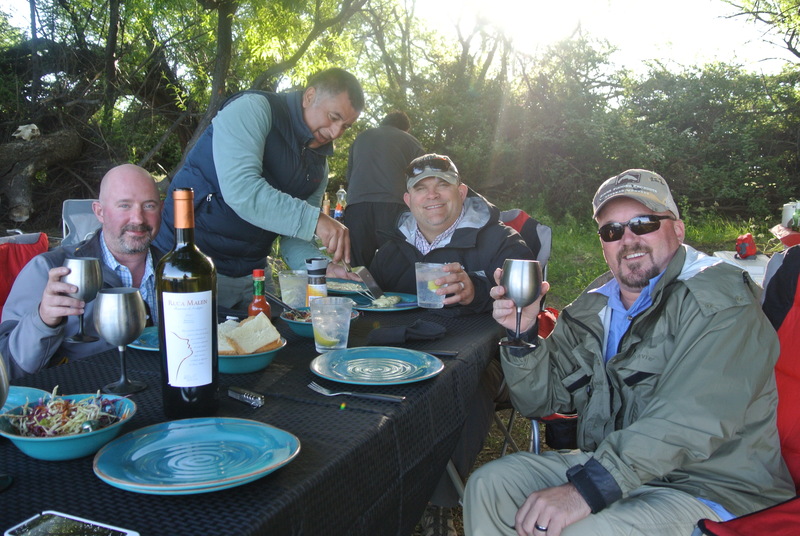 Patagonia River Ranch does a great job, and I would highly recommend them as a 5 star destination for fly fishing and lodge. 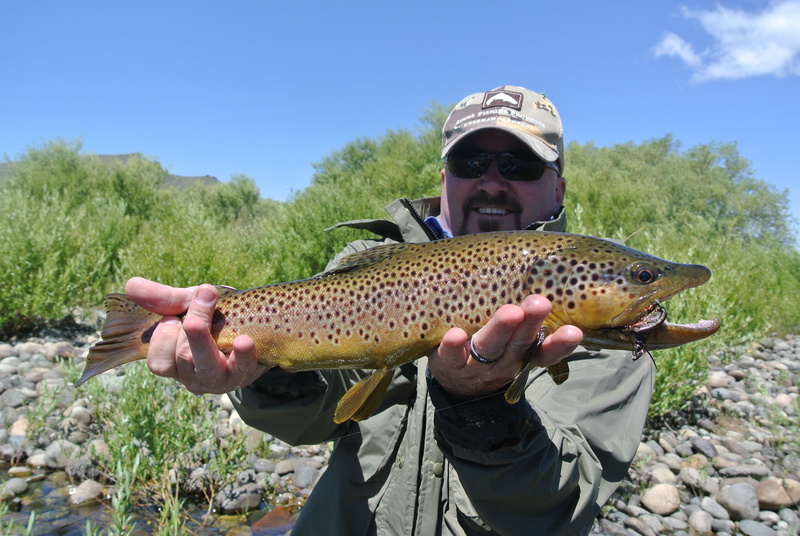 A nice brown caught on a striping streamer.